The pools and match schedule have been announced for the HSBC Canada Women’s Sevens in Langford, British Columbia, on 12-13 May, the penultimate round of the HSBC World Rugby Women’s Sevens Series 2018. Defending champions New Zealand are the top seeds following their victory at the HSBC Kitakyushu Sevens in Japan, an event which threw up some surprise results to create some intriguing pools for the fourth edition of the tournament in Langford. New Zealand will be joined in Pool A by Fiji, 2016 champions England and invitational team Brazil at Westhills Stadium. France, fresh from their first-ever Cup final in Kitakyushu and semi-finalists 12 months ago in Langford, will face Russia, Dubai runners-up USA and Japan in Pool B. Pool C is arguably the most intriguing with series leaders Australia, Kitakyushu semi-finalists Spain, Ireland and host nation and 2017 runners-up Canada drawn together. Russia and USA will get the tournament underway at 10:30 local time (GMT-7) on 12 May. 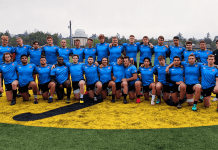 World Rugby Chairman Bill Beaumont said: “We look forward to what promises to be another exciting weekend of high quality rugby sevens in Langford. The number of breakthrough performances at the third round of the series in Japan last month was a great demonstration of the competitiveness that now exists in the HSBC World Rugby Women’s Sevens Series as the traditionally strong nations are being challenged by emerging powers from around the globe. Australia currently lead the standings with 56 points, six more than defending series champions New Zealand with Russia third on 42 points, just ahead of France (40) with Spain and Canada back on 32 points.